Dr Eric Daiter is a highly regarded infertility doctor with 20 years of experience. Dr. Daiter has personally witnessed which treatments are effective in different situations. If you are having trouble getting pregnant, Dr Eric Daiter is happy to help you (in the office or on the telephone). It is easy, just call us at 908 226 0250 to set up an appointment (leave a message with your name and number if we are unable to get to the phone and someone will call you back). "I understand that the economy is very tough and insurance companies do not cover a lot of the services that might help you. I always try to minimize your out of pocket cost while encouraging the most successful and effective treatments available." 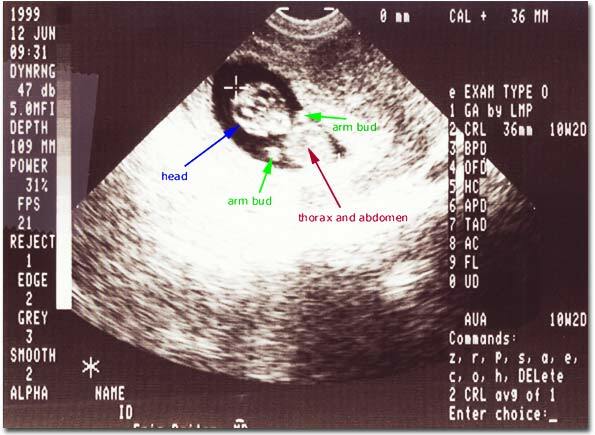 Photograph of a transvaginal ultrasound scan that reveals a single intrauterine gestational sac within the uterine cavity at 10 weeks gestational age (8 weeks after fertilization). The growing fetus occupies most of the gestational sac at this stage in development, the head is very clearly distinguished from the torso (thorax and abdomen), the brain with ventricles and two hemispheres is visible, and arms with hands and legs with feet can often be appreciated.